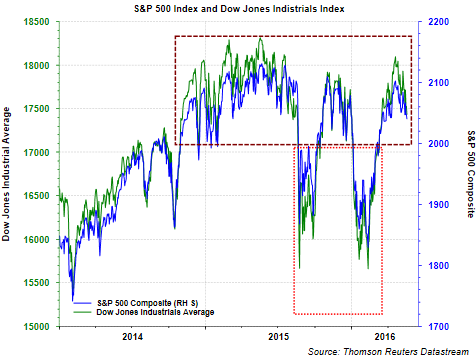 One thing investors in equities know is the market has essentially traded sideways for nearly two years. During this two year period, this sideways chop has included sharp pullbacks, one in late 2014, two in 2015 and the latest in February of this year. For long term investors this can be disconcerting for sure, so what headwinds are influencing the equity markets and will they subside any time soon? 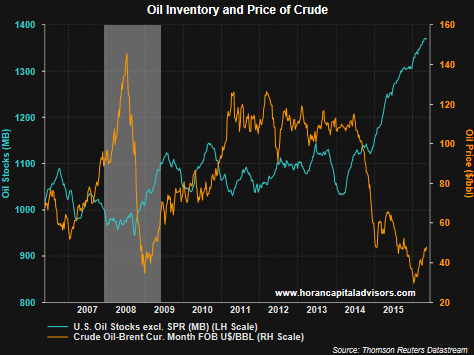 The oversupply of oil and the downward pressure it has placed on prices (until recently) has had a negative impact not only on the energy sector, but across other segments of the economy (industrial companies) that sell into the energy space. The energy weakness resulted in a contraction in earnings for companies in these segments. However, since oil price lows reached in February, crude prices are up over 80%. Whether this is sustainable is questionable, but, with higher crude prices, companies in the energy sector, and those that sell into the space, are likely to see better earnings versus last year. 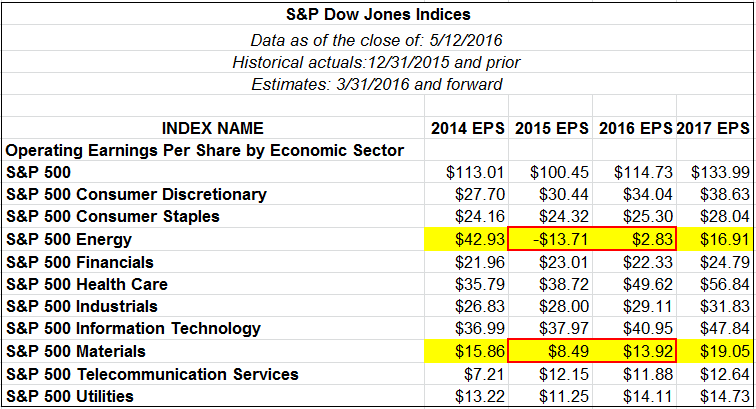 This leads to possibly the largest factor facing the market: earnings. As the below chart clearly details, double digit earnings growth in early 2014 turned into an earnings contraction. 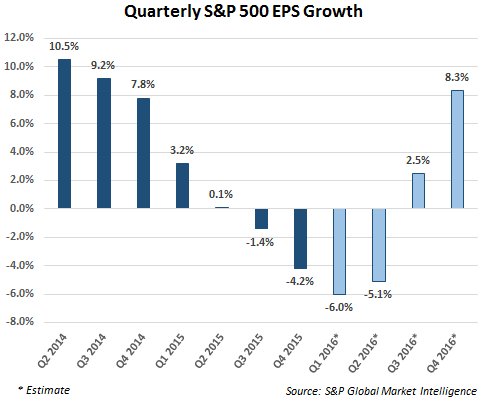 Combining the four quarters of 2015, the earnings for the S&P 500 Index were essentially flat. This contributed to a flat equity return for the S&P 500 Index for calendar year 2015. Since stock prices have a tendency to follow earnings over time, the trough in earnings in Q1 2016 may give way to earnings 'growth' into Q4 2016. One then asks, how is this growth possible. Two factors are occurring that may contribute to EPS growth from here. One, the US Dollar strength that took place from mid 2014 and into 2015 has turned into weakness over the last 12 months. The result is multinational companies should experience less of a headwind from translating non US earnings back to the US Dollar. Secondly, as noted earlier, the increase in oil prices is anticipated to have a positive impact on S&P 500 earnings. The below table shows quarterly operating earnings by sector for the S&P 500 Index. Evident from the table is the favorable swing in earnings for both the energy and materials sectors and the positive impact on expected earnings growth for the index. 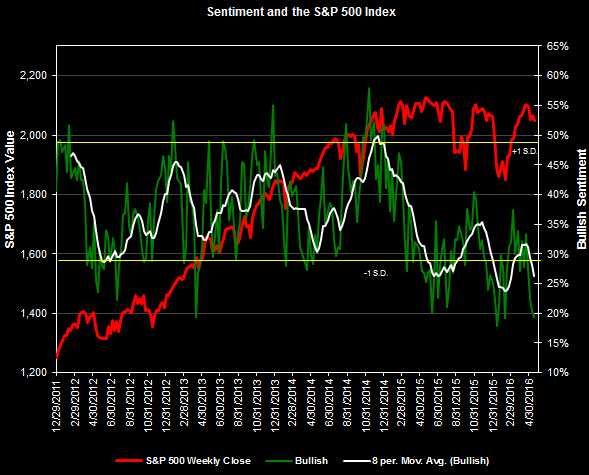 Lastly, the Fed and the future direction of interest rates is impacting market sentiment. With the release of Fed minutes earlier this week, it appears a June rate hike is back on the table. The Fed did move rates higher last December and multiple hikes were expected in 2016. It is looking more likely that one, two at most, rate hikes may occur this year, all else being equal. This move higher in short rates is causing the yield curve to flatten, which could lead to an inverted yield curve (short term rates higher than long term rates.) 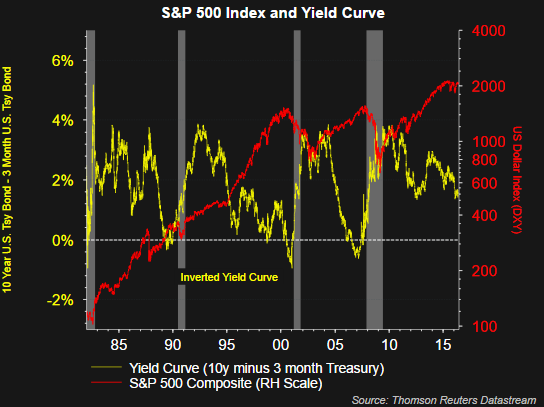 An inverted curve does not always translate into a recession. However, the interest rate curve has been inverted when the onset of a recession takes place. As the above chart shows though, the curve is far from inverted at the moment. One result coming out of a Fed that is increasing interest rates is a slowdown in economic growth. Historically though, the initial moves in rate increases by the Fed is pursued to get rates back to a more normal level. As a result when interest rates are increased from a level below 5% stocks tend to rise. 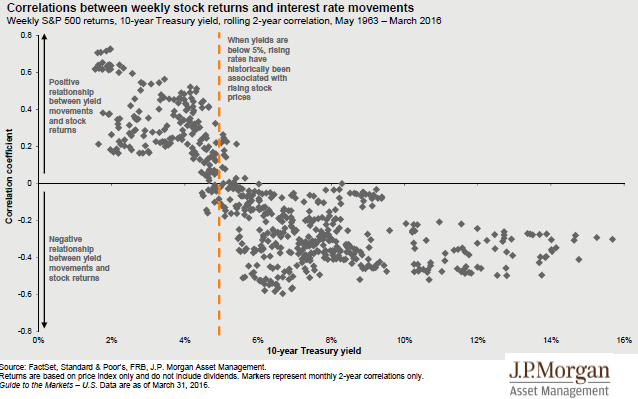 In short, below the 5% level there is a positive correlation between interest rates and stocks. 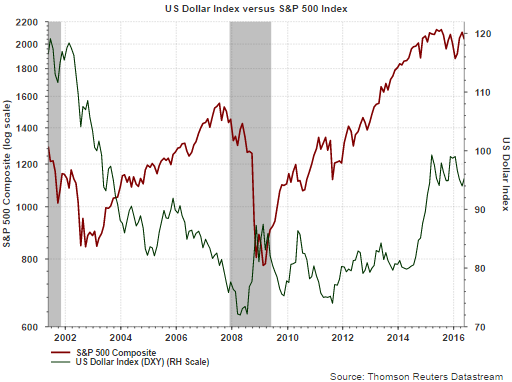 With investor bullish sentiment at an extremely low level, an expectation of an improving earnings picture and a market that has traded sideways for nearly two years, subsiding headwinds could certainly translate into a positive equity environment in the second half of this year.